Generalized Space Shift Keying (GSSK) modulation is a recently proposed low-complexity concept for Multiple-Input- Multiple-Output (MIMO) wireless systems. GSSK modulation is a generalized version of Space Shift Keying (SSK) modulation, which provides a better spectral efficiency through multiple active antennas at the transmitter. An apparent weakness of GSSK modulation is that it does not exploit the transmit-antennas to achieve transmit-diversity. In this paper, we propose a precoding method for GSSK modulation, which simultaneously achieves high diversity and coding gains. The solution is based on: i) cophasing the active antennas of each spatial-constellation point; and ii) properly rotating the phases among spatial-constellation points. The new scheme requires Channel State Information at the Transmitter (CSIT), i.e., the channel phases of each wireless link, which can be obtained through a feedback channel. For the case of a perfect feedback channel, we analytically show that for three and four antennas at the transmitter a full transmit diversity can be achieved without reducing the achievable rate. Furthermore, for various MISO configurations and achievable rates we show through Monte Carlo simulations that our proposed scheme outperforms state-of-the-art open-loop GSSK schemes, in terms of both diversity and coding gain, when the number of bits allocated for the quantization of each channel phase is between 2 and 4. Ntontin, K. [et al.]. 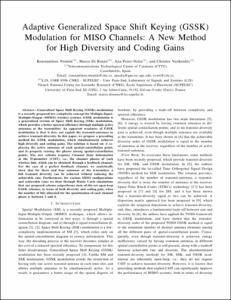 Adaptive generalized space shift keying (GSSK) modulation for MISO channels: a new method for high diversity and coding gains. A: Vehicular Technology Conference. "2012 IEEE 76th Vehicular Technology Conference". 2012, p. 1-5.